The Series Remote from E-Stim Systems. Keyfob Transmitter with battery 3.5mm to 2mm output cable 4 Self Adhesive Electrode Pads Carry Case Comprehensive User guide Now we have can offer the latest in E-Stim Technology with the E-Stim Systems Series 1 Remote K.. 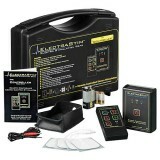 The Controller Remote Controlled Electro Stimulation System from ElectraStim. The "Controller" Transmitter Unit The "Controller" Receiver Unit Stimulation Output Cable Leather Belt/Harness Pouch ElectraPads Square x 4 LR1 Batteries x 2 PP3 Batteries x 1..